Largest of the Indian Ocean Islands ( the world's fourth-biggest island which stretches 1590 Km from North to South and reaches 590 Km at its widest point : 587 000 sq Km ), Madagascar is a land rich in diversity, both with regards to its natural wonders and endemic wild and plant life species, as well as the rich cultural background of its people. It has been relatively isolated from the outside world. Consequently it has not been exploited by the effects of mass tourism, thus remaining one of the world's great undeveloped and undiscovered eco-tourism adventure destinations. About 200 million years ago this land began to break up into the present day continents of Asia, Australasia, South America, Antarctica & Africa. 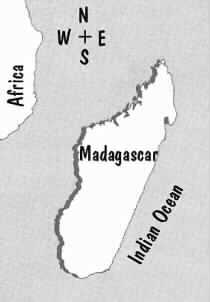 Madagascar broke away from Africa about 165 million years ago. As the island drifted eastwards into the Indian Ocean, it took with it a large variety of plant and animal stowaways. Free from predators, these flourished & evolved into many different species, most of which are endemic to the island. So, Madagascar is a wonderland for the botanist & the island invites further exploration of animal, plant and birdlife, the species found nowhere else in the world. Each climatic region in Madagascar is associated with a different vegetation type : thorny scrub in the South, tropical rainforest along the East coast, heathland & moss forest on the central highland and savannahs throughout much of the western lowlands. In each of these habitats resides a distinct set of plants & animals, most of which are found nowhere else in the world. The flora of Madagascar has its own pecularities, such as : the Ravinala also called " the Traveller's palm ", the Baobab of which there are 6 distinct species, the 9 species of Pachypodium or elephant's foot, a thousand varieties of orchids, the bizzare spiny forest of the arid South ( such as the spined Didiera & Alluaudia ) and the 60 endemic species of aloe, etc. The lemurs ; the other mammals such as 21 species of tenrec, 28 species of bats, little carnivorous ( mongoose, the reddish fosa - foosh -, rodents including a giant jumping rat ) ; birds : just 250 species, of which 106 are endemic ( more productive habitats include the humid forest of the North, the spiny forest of the South & the eastern rainforest : coua sp., vanga sp., the vasa parrot, the Madagascar malachite kingfisher, the crested drongo, the Madagascar fody - food - and a variety of owls, doves, cuckoos & wild ducks ) ; reptiles & amphibians : the most visible are the chameleons, which have come to represent the country nearly as well as the lemurs. Most of the world chameleons are found in Madagascar, with 2 endemic genera, the large Chameleo & the smaller Brookesia. Gecko sp., the superbly camouflaged leaf-tailed gecko, iguanas sp., the Nile crocodile ; plus 60 species of inoffensive snakes ( the most frequently observed is the Madagascar boa ) ; tortoises & marine turtles. For frogophiles, Madagascar is a paradise with 150 species of frogs & toads ( 148 of these are found only in Madagascar ) ; invertebrates : very interesting with mantids, butterflies, moths, millipedes, leeches, dragonflies, beetles, spiders & mosquitoes. The only dangerous animals in Madagascar are crocodiles, sharks & scorpions ( especially in drier areas - Active at night & inflict painful & potentially dangerous sting. Those camping in the bush should careful to check their boots, shoes, tents, backpacks, sleeping bags, clothing & ground ). Talking about the different habitats of birds in Madagascar, there are 7 types : the eastern humid forest, the western deciduous forest, the southern dry forest, the coasts, the eastern wetlands, the western wetlands and the savanna. a- Lowland rainforest : below 600 m, where trees are often very tall ( up to 50 m ) and epiphytes ( especially ferns & orchids ) are very abundant. You can find : Scaly Ground-roller, Bernier's & Helmet Vangas, Red-tailed Newtonia, Red-breasted Coua, etc. This area includes Masoala Peninsula National Park. b- Mid-altitude forest : between 600 to 1600 m, where trees become smaller ( 20 - 30 m ), epiphytes & Pandanus trees always abundant. You can find : Cryptic Warbler, Rand's Warbler, Grey-crowned Greenbul, Rufous-headed Ground-roller, Crossley's Babbler, Madagascar Magpie-Robin, Common Jeries, Hook-billed & White-headed Vangas, etc. This area includes Mantadia National Park & Andasibe Special Reserve, Ranomafana National Park and Amber Mountain National Park. a- Montane forest : above 1600 m, where canopy is rarely more than 7 m and with very heavy moss growth, where bamboo, palms & tree-ferns are locally common. Occurs on sandy, calcareous or lateritic soils over the entire west of Madagascar. Canopy at between 8 to 20 m, always many epiphytes ( orchids & lianas ). 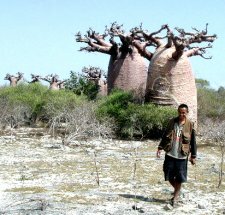 You will find there a lot of bottle-trunked trees, the best known being the baobabs. Kind of birds : Red-capped , Coquerel's & Giant Coua, Van Dam's Vanga, White-breasted Mesite, Sakalava Weaver, Appert's Greenbul, etc. This area includes Kirindy Forest, Zombitse-Vohibiasa National Park. Is particular with its cactus-like trees : the endemic Didieraceae family ( Didiera sp. & Alluaudia sp. ). A 5 - 15 m high forest where you can find Running & Verreaux's Coua, Subdesert Brush-Warbler, Subdesert Mesite, Littoral Rock Thrush, Red-shouldered Vanga, Long-tailed Ground-roller, etc. Example : Berenty Private Reserve. The west coast is much richer and more diverse than the east one ; with vast mangroves, saltpans, sandy beaches, sandbars, estuaries & offshore islands, both rocky & sandy. Sometimes with coral reef islands with breeding seabirds, example a colony of Red-tailed Tropicbirds on Nosy Ve near Anakao-Toliara. You can find in interesting estuaries ( such as Mahavavy, Betsiboka, Belo sur Tsiribihina ) migrant Crab Plovers, wintering Palearctic waders, Curlew Sandpiper, Greater Sand Plover, Madagascar white Ibis, Sacred Ibis, Madagascar Teal, etc. You can find too in some islands ( such as Nosy Be, Nosy Mitsio ) Common & Lesser Noddies, Roseate Terns, Greater & Lesser Frigatebirds, Crested & Sooty Terns ; and large populations of Flamingos & migrant waders in some lakes & estuaries. Occur in the form of lakes, rivers & marshes. Examples Alaotra lake ( the biggest lake in Madagascar ), Pangalanes canal, Vohiparara marshes near Ranomafana National Park, Torotorofotsy & Didy marshes. There are there colonies of African Spoonbills, species of Heron, Yellow-billed Storks. And near rivers : Meller's Ducks, Madagascar Rail, Grey Emutail, etc. The vegetation is often up to 3 m tall. Occur too as lakes, rivers & marshes, but include the banks and waters of the larger rivers ( Betsiboka, Tsiribihina, Mahavavy ), the salt lake of Tsimanampetsotsa & Ihotry. Several species of waterbird are found nowhere else but in these wetlands, such as the Sakalava Rail, Madagascar Teal, Great-billed & Humblot's Herons. Are dominated by alien grass, with vast areas of sterile landscape colonised by fire-resistant native trees such as the endemic palm Bismarckia nobilis & the Tapia tree Uapaca bojeri ( near Isalo National Park & Fianarantsoa ). The most frequent birds that you can find are Madagascar Cisticola, Madagascar Bush Lark, Madagascar Partridge, Hoopoe, Sandgrouse, Buttonquail, Namaqua Dove & Helmeted Guineafowl. Stripe-throated Jery too is very common. Humans have come from Malaysia, Polynesia & Africa and they, themselves, evolved into many different cultures. After the Malay-Polynesians have come new arrivals ( African slaves, Arab, Portuguese traders & French colonials ), they have formed the 18 official tribes which inhabit the island today. The Afro-Asian origin of the Malagasy has produced a people who practice fascinating customs. Each tribe has its own territory, customs & traditions. The most common language is Malagasy, of which there are several dialects. No one who visits the island is left unaffected by the warmth & hospitality of the Malagasy people. If you are the sort of traveller who craves something different and isn't put off by a bit of discomfort, Madagascar is for you. Do you want to visit another world ? I suggest you Madagascar, one of the world last bastions for wildlife discovery. Madagascar where the wild things are. Madagascar and its nature, its people, its Parks and Nature Reserves. 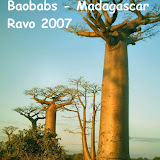 Madagascar where you will discover the kingdom of lemurs, the kingdom of baobabs and the kingdom of chameleons. With our experiences since ... 1993, we will give you excellent advice. To organise your trip and to guide you to make your trip pleasing and unforgetable. Thank's alot for your trust. Through wonderful beaches, through evergreen humid forests, through montane rainforests, through baobab forests and deciduous dry forests, and through savanna and euphorbia scrub. Madagascar, a big island which lies in the Indian Ocean, eastern of Africa. Madagascar's backbone of mountains runs almost the entire length of the island, shielding the central and western areas from the Indian Ocean winds while making the eastern areas a hotbed for torrential rains. This results in 4 dramatic climates : tropical rainforest in the East, heathlands on the High-Plateau, deciduous woodlands in the West and semi-arid desert in the South. Madagascar is becoming a new destination for ecological tour lovers, for discovery tour lovers & for trekking tour lovers. Arrival in Tana. Reception at the airport and foreign exchange operation. Direction East of Madagascar in order to discover the region and the lush vegetation of the Canal of the North Pangalanes. Along the road, you will visit a private reserve ( crocodiles, butterflies, insects and you will see a great variety of chameleons of all sizes and colours ; it is the place in Madagascar where you can best observe the largest number of different species ). Cruise on the Pangalanes Canal in the late afternoon ( with a small vedette motorboat ). Return by boat via Manambato along the Pangalanes through lakes, rivers and lagunas with traps for fish ; you will occasionally see local canoes, rafts and bush-taxi boats. Anti-mosquito spray and cream, pocket torch and spare batteries, head torch if possible, swimsuits, light clothes as well as clothes to keep you warm ( for the high grounds ), cameras, small padlocks for your luggage, your personal medicines ( current antibiotics, antidiarrhoea, antiseptics, Betadine, compresses and cotton, ointment for sprains, lip salve and other personal medicines, protect yourself against malaria, e.g. follow a treatment ) sun cream, sun glasses, walking shoes or closed sports shoes, binoculars if necessary, old clothes ( children’s and adults’ ) to give here and there during the trip ( also biros, colour pencils, old dolls, teddy-bears, small balloons, etc. ) swiss knife, k-way or windcheater, hat or cap, etc. AND cash money = euros. Madagascar boasts a tropical climate with more than half a year days of sunshine. The rainy season tends to be between December and March with the drier winter months occuring between May and September. There is however a considerable variation of both temperature and rainfall depending on the altitude and latitude. It is therefore possible to experience temperatures ranging from 0° in the highlands to 40° C on the West Coast. Precautions should be taken against Malaria. Cover yourself well with mosquito repellant from dusk onwards and burn coils at night. Drink only bottled water and execrcise basic common sense when selecting restaurants/eating out. Take along a First Aid Kit, as Tana is the only city with a hospital which meets western standards. It is essential to take out comprehensive medical travel insurance for Madagascar. The most common language is Malagasy of which there are several dialects. French is widely spoken on the island except in the remote country areas. Some English is spoken in the larger cities especially amongst people working in tourism industry. Power supply : 220 volt / European 2 prong plugs. Madagascar has been relatively isolated from the outside world. Consequently it has not been exploited by the effects of mass tourism, thus remaining one of the world's great undeveloped and undiscovered eco-tourism adventure destinations. Madagascar's tourism infrastructure is modest and unsophisticated, this being one of its many charms. Modern facilities are often not available, so having an adventurous spirit, keeping an open mind, and being willing to exercise understanding and patience, will surely assure you of a wonderful experience during your visit to this spectacular island of amazing contrasts. No one who visits the island is left unaffected, either by the warmth and hospitality of the Malagasy people, or the sheer majesty of the island's wilderness. Ravo is a real professional guide, in a country where professionalism is sometimes lacking. He is good at planning a trip, and always seizes an opportunity when there is one. An example : once our small group of eight made a short train journey, just to get the feel of train travel in Mada - as the locals call Madagascar -. It was interesting to see how the arrival of the train shook up the quiet lives of the villagers who came to the station to sell their goods and to watch and be part of the conundrum. After the train journey our two drivers with their SUVs were to come and pick us up. As it happened, they were not there when we got out of the train. Flat tyre ? engine trouble ? out of petrol ? Who knows. To make good use of the time we had to wait, Ravo took us to a nearby health centre. We could see with our own eyes how this centre was lacking in even basic medical equipment. Ravo also seized the opportunity to explain us how heath care works ( or doesn't work ) in Mada, and what the different levels of health care consist of. Ravo is a very congenial man who is always friendly and who never loses his temper. I can recommend him to any possible visitor of the splendid Isle of Madagascar.